STUDENT uptake of sheep and wool courses at the University of New England has tripled in the last 10 years, but the overall number of agricultural students is waning, a Wool Week luncheon crowd was told last week. 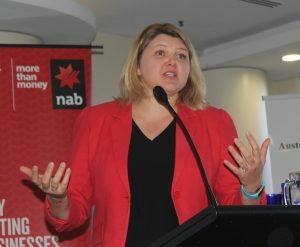 UNE lecturer Dr Emma Doyle told the Wool Week luncheon attendees in Melbourne on Thursday that although there were four jobs available for every graduate completing the University of New England’s agriculture courses, agricultural enrolments had steadily plateaued since 2014, following a drop of students by half since 2000. Dr Doyle said she had been lecturing agriculture at UNE for 10 years and students were taking a Bachelor of Agricultural Science or Animal Science at the university. They are introduced to sheep and wool in their second year and then have the option of taking on further Australian Wool Education Trust-funded wool electives through distance education or intensive three-day schools. AWET units offered at UNE included sheep production; sheep management; wool technology, biology and measurement, and wool marketing and processing. She said the three-fold increase in the number of students studying sheep and wool at UNE since 2007 was coming predominantly students studying UNE degrees. There are passionate students out there who want to do sheep and wool, she said. “So for the last few years we’ve been getting just over 100 students studying the suite of five sheep and wool units, which is really promising, particularly as we’ve had a 50pc decline in ag students. However, Dr Doyle said the decline in UNE students studying agriculture had started in the early 2000s. From about 2014, UNE has had a “steady petering” in agriculture enrolments. “We’re not on the rise yet, but at this point we’ve actually got four jobs available for every graduate that is leaving an ag degree, so there is a huge amount of opportunity for these. But she said 19 of the 20 past AWET wool scholars were still working in agriculture, including three as veterinarians. “The one that left is a yoga instructor, I believe, I’m not really sure where we went wrong there. ”Half of those are in the sheep industry and I think those are pretty good stats, considering that these students were given their scholarships out of school and normally most 18-year-olds don’t really know where they want to head. “So I think we have steered them in the right direction, which is great,” she said. Dr Doyle said she loved now actually working with former students, including Elders Walgett wool broker Brett Smith, Elders wool technical officer Sam Wan, Zoetis’ Jock Munro and NAB agribusiness managers. Dr Doyle said UNE had been surveying its sheep and wool students since 2010 and most of them were coming from the major wool-growing states including New South Wales, Victoria, Tasmania and Queensland. “The interesting thing, which I found a little overwhelming when I walked into this room, was that 61pc of the students who are coming are female. “So I’m thinking in 10 years’ time this luncheon might be look a little bit different,” she said. She said 65pc of the sheep and wool student were raised on rural properties, but many have had no agricultural background. Dr Doyle said 54pc of the sheep and wool units graduates were still in the industry, as brokers, consultants, farm managers and in education. About 30pc had returned to their home town or area. But she said 75pc of past sheep and wool students surveyed thought jobs were not readily available, because they were not advertised or there were limited jobs in the industry. Dr Doyle said 25pc of past wool students worked within the sheep and wool industry, but left within 5-7 years. More than half claimed this was due to better opportunities elsewhere. “So obviously they are not seeing the progression in the industry for them and they are moving on, and we just can’t afford to have that if we want to progress down the track. “In the next five years, 30pc think they will be in the sheep and wool industry, half of them will still be in ag and then we’re losing 20pc who are taking other opportunities,” Dr Doyle said. “I think this is key, because an ag degree provides such a good skill set, you can actually go across sectors and go other places. Dr Doyle said UNE was putting together a graduate certificate in wool science, including four units over two years of study. What is the point of a sheep and wool course? There are 19,200 registered wool classers now according to AWEX or one to every 88 bales per year. The only people making a living would be those teaching it.